Amazon's internal currency will make it even easier to spill your money on Kindle FIre apps. Amazon will launch its own currency in May, known as Amazon Coins. 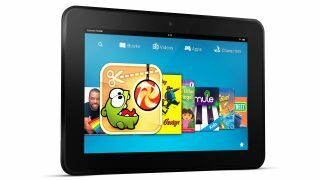 Exclusively for use with Amazon's Kindle Fire range of tablets, the currency will let you buy apps, games and in-app purchases. Like all currencies companies invent, it's hard to see much of a boon to us consumers. In theory it makes it easier to buy from Amazon, but with one-click purchases already present and correct, how much easier can it get? Instead, Coins is aimed at increasing profits for Amazon, as well as anyone selling apps and games through it. When it launches in the US in May, Amazon will dish out tens of millions of dollars' worth of Amazon Coins for free, helping spread awareness of the new currency as well as stimulating sales. Amazon doesn't make a profit from its tablets and e-book readers, thanks to their low prices, so relies on big sales of e-books, films, music and games from its online store. Hence it's hardly surprising it wants to find new ways for us to spend. "Developers continue to report higher conversion rates on Amazon compared to other platforms," Paul Ryder, Amazon's Vice President of Apps and Games, said in a statement. "Now we have another new way to help developers reach even more of our millions of customers." Developers will still make 70 per cent from each sale using Amazon Coins. Only apps and games approved before April 25 will be eligible for purchase using the currency.